Paul: Alright, where do you want me? Gimme the A-1. Quinns: What? Put the saxophone away, Paul. For day 4 of Golden Week we’re doing something a little different. Five months ago I asked our SU&SD donors to tell us why they donate. Today, we’re going to let them do the talking. Paul: Quinns. This is my dad’s saxophone. You can’t tell me to go and get it and then have me put it away without busting loose at least one hot splank. That’s just funk-a-logical. I’ve stopped and restarted this e-mail many times over, trying to explain why I support SU&SD with my dollars and my hyperlinks – desperately struggling to render my appreciation with wit and panache, preferably by using words like “panache,” because that’s always sure to impress. But simpler words might fare better: Shut Up and Sit Down is a lot of different things: it’s a brilliantly-written comedy, a labor of love, a thriving community of supportive, progressive game-likers from around the globe. It’s something that makes me excited every time I see a new update, because I love to laugh and I love to learn about the things that make this hobby great. But the real reason I support SU&SD is that the show supports me and my friends – it gives us new worlds to explore, new ideas to discover, and new ways to spend time together, to laugh, to struggle, to triumph, whether it’s against alien invaders, social dynamics, or ancient architecture. Shut Up & Sit Down is an engine that tirelessly provides me the ability to share these great experiences with others, and for that, I’m very thankful. which might sound flippant, but i mean that i genuinely admire your ad-free, kickback-free, begging-light model and part of supporting you is supporting the belief that doing the interwebs this way is not only feasible but necessary. With intelligence and imagination, SU&SD questions what truly makes games fun. The result is I am having more fun! Donating to you is my way of saying “thank you” for something unique and inspiring in a sometimes unfriendly internet world. You welcomed me in and made me laugh. It’s only polite to give something in return. I’ve been a gamer my whole life; video games, tabletop role playing games, board games. I love them all in their own way, but in particular, the games we play together in person have been a key lynchpin for my group of friends over the years, as people have inevitably grown older (40s now), got married, had kids etc. Whatever happens, we get together most Monday nights, year after year, to game together – mainly tabletop RPGs. But those put quite a workload on the GM – we pass the role around but still – and sometimes we had to cancel because one or two people couldn’t make it. When we started to discover how board games were changing and improving over the last 5 years, it changed the whole dynamic. Suddenly we have a bunch of games that are not just an excuse, a crutch that we just pull out to talk over, but something really engaging that we can mix in with our traditional RPG nights far more fluidly, whether it’s just that the GM needs a break for a couple of weeks to prepare, an important player is missing, or just because we feel like board gaming instead. Enough background, what about the original question? Well, SUSD has been one of the primary drivers of our discovery of modern board gaming. Our wish list of games is mostly drawn from your reviews & let’s plays, and you’ve consistently gotten us excited about new games, helped us identify what works well, what suits our preferences, what niches we have & haven’t tried and so on. After we discovered SUSD we spent many evenings catching up on your back history of videos and were really disappointed when we reached the bottom of the mine. I knew then that we just didn’t want this project of yours to end, that we wanted to do something to help you continue – entirely selfishly really, we just wanted more videos ;). The gold club was an obvious choice, and we haven’t regretted it one bit. Good things are worth support, because free things that are bad are, well, just bad really. I think it’s a realisation by now that actually getting stuff for free from the internet isn’t the golden age we thought it was going to be, so if you like something, pay for it. I guess the only way to convince people to do that is to keep putting out great content and hope people come around to the way of thinking. Maybe it’ll make people on the internet less likely to be arseholes, so what I’m saying is that donating to SU&SD might cause a break out of world peace. But seriously, everything feels grown up and sensible like a site for adults because of the quality of it all, even when you’re four layers deep into a Inception/Unknown Kadath parody review of Tash-Kalar. Anyway, a heartfelt thanks from me for the site and the tonne of good game recommendations. Best of luck with the 2016 donation drive. I was lucky enough to discover the site just before the gold club launched and within a few days of reading reviews I was handing over my money. If there’s a funnier, warmer, more trustworthy board game review site online then I haven’t found it yet. I feel I get great value for money and am proud to support a site that shares the same attitudes and ideals towards gaming that I have. Also, I wouldn’t have got into playing netrunner if it wasn’t for Quinn’s early reviews which has allowed me to meet so many lovely people and share such great memories. So much of the atmosphere on the Internet is hardened cynicism, so many critics making sure you know they’re too cool for whatever it is they’re talking about. Shut Up and Sit Down is the opposite of that. SU&SD has created a safe haven for enthusiasm, for ridiculous fun, and for the kind of all-in play that we too often keep in check within ourselves. They’re funny, sincere, and they show us how important play is in life, and how shouting with your friends can be the most fun you’ve had in months. Bring Skull to a bar sometime, then thank SU&SD for making sure you knew about it. Thanks for all you do, and here’s to another year of it. I give your show money because you do great work with it. 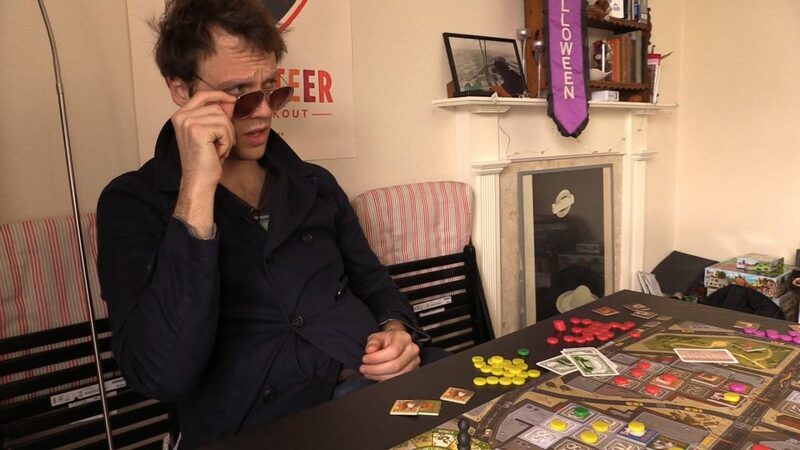 Many viewers may not realize what a luxury it is to have talented people take on the subject you love (board games!) like real journalists. You explain what is great about modern games while challenging them to be more. You’re funny, informative, and thought provoking. Watching your videos has helped me find better games, make better games, and understand games better. That’s why I give your show money. Boardgames take my money, and turn it into cardboard, plastic and joy.SUSD take my money and turn it into words, videos and joy. I can’t think of a more lovely alchemy to engage in. On top of that, SUSD recognise and celebrate so hard the fact that gaming isn’t just about making a tough choice, or throwing dice with your heart in your mouth, they know that it’s about the people you do it with (even when you play it with yourself). They don’t play cards against humanity, they play cards for humanity. The heart and passion the team shows has somehow done a magic thing and brought together a weirdly tight-knit community. It’s the only comment thread on the internet that is not only humane (almost exclusively) but actually lovely. I don’t just enjoy reading them, I feel obliged to post way too much, as a way of feeding this wonderful thing. I didn’t just want to read, but to share, in the same way Quinns, Paul, Matt, Pip and everyone else share. I love games because they bring people together and lets them do horrible things in a safe and funny environment. I love SUSD because it brings people together and encourages them, implicitly, to not be horrible, but instead just be safe and funny. I jumped enthusiastically at the opportunity to moderate the forums, just because I wanted to help keep this lovely community together. I haven’t needed to, everyone’s lovely. It’s the easiest job I’ve ever had. I’m also totally in love with all the other mods, and whole swathes of forum dwellers and comment threaders, whose wit, intelligence and willingness to pun and forgive sets my heart on fire. I feel privileged to have met so many of these people, a surprising number in person, as well as digitally. I think it’s amazing what SUSD has done, and can’t wait to see what it will do next. And I will do anything within my means to make sure that they are able to keep on pouring love, intelligence, wit and excitement into more stories about boardgames. Boardgaming is about people, and SUSD is full of the best people, above and below the line. People who care for each other, people who play with each other. 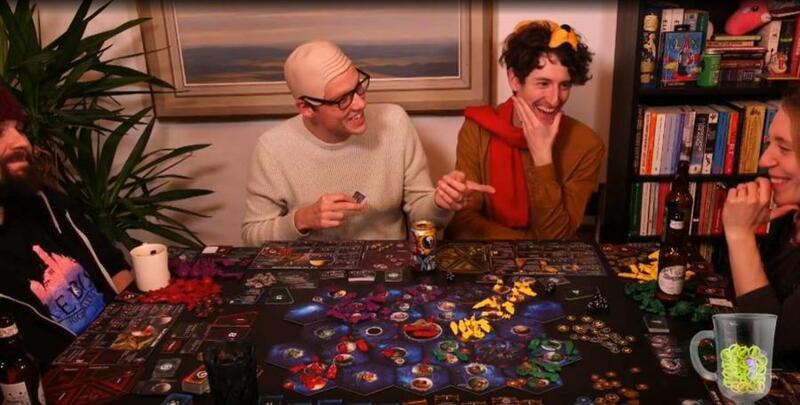 Boardgames deserve this playfulness. We don’t deserve SUSD. But we have it. We are lucky. Shut Up, Sit Down, and take my money. Shut up and sit down helped me build a wall of games, that I can now take out and delight people with. They helped me learn how to teach, how to play, and how to not take it too seriously. I love this hobby because it has to be shared, and I give time and money to shut up and sit down because I want it to be shared further than I can reach on my own. I give money to shut up and sit down because I want them to keep talking and stand up. I support Shut Up and Sit Down because they kind of feel like family, and I want to make sure they’re okay. I’m pretty sure they are, but it’s nice to know I’m doing something to help. I just think the world would be a bit less bright, orange and pear shaped without them. I also support Shut Up and Sit Down because if I spent all my money on boardgames, I’d run out of space. Quinns: Oh god. I’ve got something in my eye. Paul: Me too. Quick! To the English weeping chamber. We can hide there until this passes. Thanks so much to everybody who’s donated so far, but we’re still a little ways off where we’d like to be, financially speaking. Please: If you’ve been enjoying Shut Up & Sit Down for years and you’ve always thought about donating, now is the time. If you’d like to donate to SU&SD, you can do so right here.